Hi, my name is Zarina and up until a few weeks ago I had never read a Maggie O'Farrell novel. Crazy, I know. I've heard unanimously positive things about her writing yet somehow it wasn't until her brand-new book, This Must Be the Place, was taking over my Twitter timeline that I finally discovered her stories for myself. It was a wonderful experience and it made me kick myself for leaving it so long. This Must Be the Place is the story of Daniel and Claudette, both as a couple and as two individuals growing up and finding their own true selves. We first meet them at their rockiest of times and their relationship seems beyond repair, yet through flashbacks and seeing the two protagonists through the eyes of other characters, it becomes evident that these two individuals are more entwined than they realise. While their marriage seems broken, that doesn't necessarily mean that they can live without each other and that is an interesting starting point for this beautiful book. Chronicling the lives of the two main characters across decades and continents, this novel is a hefty one. Yet despite the amount of life-changing moments that are captured within the pages, compared to most other books I read very little actually happened. This isn't an action-packed adventure or pacy thriller, instead the story unravels at a very slow but incredibly carefully crafted pace as we get a glimpse into seemingly disconnected snippets of the characters' lives. Of course these fragments spanning decades aren't disconnected at all, they slowly but surely show the full story of Daniel and Claudette's love for one another, and when the pieces slot cleverly into place to become a whole, that is a magical moment. While this is foremost the story of Daniel and Claudette, I was surprised by how powerful the impact of some of the other characters was as well. Despite not featuring heavily in the first half of the novel and not truly getting a voice until the end, I absolutely adored Ari, Claudette's son, and Niall, Daniel's son. The decades that pass don't age Daniel and Claudette quite as much as the younger characters, who grow from children into teenagers into young adults, all within the space of a single book. I loved them so much, in fact, that there were times I grew a little impatient with the adults and just wanted to read another chapter featuring Ari, Niall, or one of the other children. This is one of those novels where my review will never do justice to how incredible the experience was of reading it and how impressively beautifully it has been written. Maggie O'Farrell's command of language is stunning and more intricate and awe-inspiring than any piece of writing I've ever had the joy to read. I completely understand why her books are unanimously well-received and people cannot stop raving about them. Maggie is an exceptional writer and to have had the opportunity to immerse myself in her words feels like a true privilege. This Must Be the Place isn't a novel you pick up for the story or characters, how fascinating they might be. This is one you read because you want to feel; inspired, in awe, and grateful for having had the chance to read a true work of art. 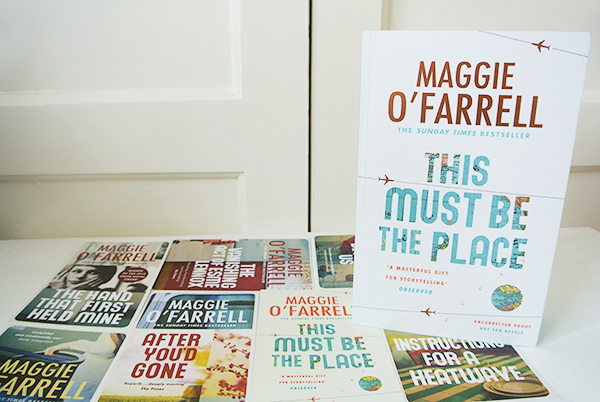 This Must Be the Place is published by Headline and you can buy a copy from Foyles or your own preferred retailer. Such a beautiful review! Can't wait to read the book!